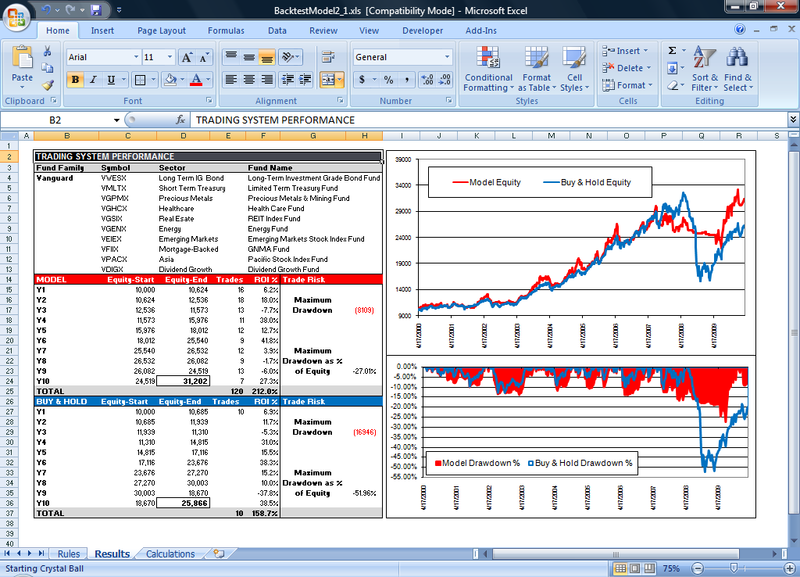 This online course shows you how to build a long term sector fund rotation model using Microsoft Excel. Microsoft's Visual Basic (VBA) language is used with Excel's user interface, formulas, and calculation capabilities to deliver a powerful and flexible investment tool. The Model is based on the classic market economist's Sector Rotation Model, providing several crucial improvements that eliminate the guesswork in timing fund switches. ...... Over long periods, the strategy can outperform diversified buy and hold mutual fund investing by a significant margin by focusing capital in the economic sectors most likely to outperform the overall market at any given time. The automated model incorporates three proven technical indicators--long term relative strength, moving average crossovers, and moving average slope, to identify the sector funds most likely to provide long term profits. The system can be used with any mutual fund, index fund, SPDR, ETF, future, or other index security to allocate capital to the most profitable sectors of the market. Simply run the system on a weekly basis and make your investment decisions. The model uses weekly .CSV price data files available for free over the Internet from Yahoo!Finance or other data provider. Alternately, you can use an automated DDE data link from your own data provider if desired. Qweas is providing links to Build an Automated Sector Fund System v2 as a courtesy, and makes no representations regarding Build an Automated Sector Fund System or any other applications or any information related thereto. Any questions, complaints or claims regarding this application Build an Automated Sector Fund System v2 must be directed to the appropriate software vendor. You may click the publisher link of Build an Automated Sector Fund System on the top of this page to get more details about the vendor.